A few years ago, we were absolutely blown away by the history we found nestled among the old industrial grittiness of Perth Amboy. Once the capital of East Jersey, the city is home to the oldest public building still in use, the state's oldest Episcopal parish, what was arguably once the oldest corporation in America, and the vestiges of a once-busy port. We barely scratched the surface on our visit and vowed to return sometime to see more. The opportunity came with the arrest of a governor. Well, the reenactment of an arrest -- of William Franklin, the last Royal Governor of New Jersey. As befits his title, Franklin was a Loyalist allied with the government of Great Britain during the time of the American Revolution. His home, known as the Proprietary House, survives, representing the only royal governor's home still standing on its original grounds. I'd seen photos of the house's exterior, but I was still taken aback when we pulled up. This was a massive pile of bricks in a residential neighborhood, a real survivor. How could it have been there all these years without being more widely known? The inside, what we could see of it, was just as impressive. We walked in to find a spacious center hall flanked by two parlors, one of which was decorated as a stately dining room. One of the basement rooms was interpreted as the kitchen, complete with massive hearth, while a barrel-vaulted storage room was set for a future event. Upper floors were off limits, but a view up the center of the staircase sent the imagination reeling. How many rooms are up there, and how many stories could be told in them? No doubt, the awe we felt was exactly what its architect intended for the home of a provincial leader. Construction on the first portion of the house began in 1761, funded by the Proprietors of East Jersey as the official residence for the Royal Governor. The design, while somewhat severe on the outside, was grand: constructed of brick imported from England, its two stories, plus an attic and full basement made it one of the largest houses in the 13 colonies. Four chimneys served its many fireplaces. Franklin was appointed governor in 1763 but didn't move into the Perth Amboy mansion until 1774; he'd lived at his Burlington estate until funding issues for the home could be worked out. While he sometimes gets a bad rap due to his loyalist leanings, Franklin enjoyed moderate popularity in the early years of his tenure, developing a welfare program of sorts to help farmers during lean years, and running lotteries to fund bridges and roads. After the start of the Revolutionary War, he supported a reconciliation with Great Britain, a stand that eventually led to his arrest on June 17, 1776. 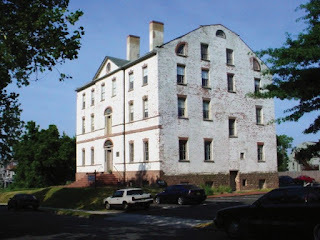 While his wife Elizabeth remained at the Proprietary House until escaping to New York in 1777, Franklin was imprisoned in Connecticut. Neither ever returned to the Perth Amboy house. Wow, that's a lot of stairs! Reportedly the house was used by both the American and British forces at various points during the Revolution; what's known for sure is that it suffered a near-devastating fire. A merchant and real estate investor named John Rattoon bought the property in the 1790s, repaired the damage and sold it to New York hotelier Richard Woodhull in 1808. Renaming it Brighton House, Woodhull envisioned two new wings for the house, which, with its location on a bluff above Raritan Bay, became what was arguably one of New Jersey's first seaside resorts. However, he only managed to get one wing built before the War of 1812 prompted an economic downturn. By 1817, he'd sold the property to Matthias Bruen, one of the wealthiest men in America, who made it his family estate. Following his death in 1846, Bruen's heirs made the property a hotel once again, later donating it to the Presbyterian Church as a retirement home after another financial downturn in the 1880s. Ultimately, the Proprietary House became a rooming house known as the Westminster, the spacious land surrounding it sold as separate lots, and Kearny Avenue run through what had been its front yard. Conditions deteriorated in the early 20th century, but local historians raised hopes that the building would eventually be restored to tell the story of Franklin and the turbulent Revolutionary years. Today, the Proprietary House is owned by the State of New Jersey and managed by the local Proprietary House Association, which is responsible for raising the funds to restore and interpret the ground floor and first floor of the building. 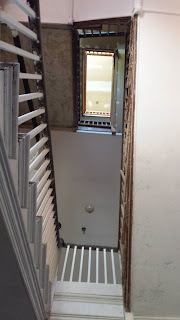 A separate organization is managing the restoration of the 1809 wing and the upper floors of the main structure as offices, reflecting the realities of historic preservation today. While the dream of any historian would be to restore a building to its original condition, the economic realities of managing such a large structure usually point to finding tenants. And buildings nearly always fare better when they're occupied. Walking around the house, I could understand why the Proprietary House Association folks are proud of the building and eager to tell the story of Franklin and his arrest. The Revolution was more complicated in New Jersey than most people realize, and Franklin seemed to be doing the best he could in what quickly became a no-win situation for him and his family. While he supported reconciliation with Great Britain, his own Assembly pushed for independence, a force too powerful for him to deny. It's a story not often told, and fortunately the Proprietary House still stands to help tell it. Looking at the house from the outside, you wouldn't be able to tell what kind of history the building holds to be honest. But there're probably secrets in those storage rooms somewhere, aren't there?